Colorado craft beer is well known here in the USA, but now it's becoming known in Europe as well. Ska Brewing has been distributing beers to Sweden for a couple of years and are now collaborating with a Swedish brewery on another project. Read their Press Release from today and see what's happening in the Eastern hemisphere with Ska Brewing Company. 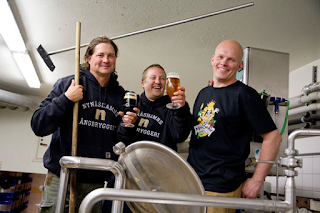 [PRESS RELEASE] Durango, CO., (May 22, 2013) — Ska Brewing Barroom Hero Arlo Grammatica is in Sweden this week, along with Head Brewer Thomas Larsen, to brew an imperial pilsner with Swedish craft brewer Nynäshamns Ångbryggeri. Nynäshamns Ångbryggeri is a small and rising Swedish craft brewery whose relationship with the Ska crew was born at the Stockholm Beer and Whisky Festival last year, from a mutual love of outdoor adventure, and of course, great beer. Grammatica and Larsen will also be celebrating the 20th anniversary of Oliver Twist, a Stockholm bar known for its selection of American craft beers and owned by the same partners as Great Brands, Ska’s distributor in Sweden. According to the Brewer’s Association, Sweden is the 2nd largest export market for U.S. craft brewers after Canada. “They’re going to show us around on their boat and take us kitesurfing,” said Grammatica. Ska has been selling its beer in Sweden for 2 years, after its flagship IPA Modus Hoperandi won the first-ever listing for a canned craft beer with the Systembolaget, Sweden’s alcoholic beverage monopoly. Based in Durango, Colorado, Ska Brewing was founded in 1995 and now produces over a dozen medal-winning beers including the Pinstripe Red Ale, True Blonde Ale and Steel Toe Stout. Four Ska beers are now widely available in cans: ESB Special Ale, True Blonde, Modus Hoperandi IPA and the summer seasonal Mexican Logger. For information, music and a good time, visit www.skabrewing.com. Chat us up and get the latest news at facebook.com/skabrew and twitter.com/skabrewing. - Ska Brewing announces their 2012 results. - Ska Brewing and DC Brau collaborate on Taster's Choice. - Ska Brewing Hibernal Vinifera Stout review.